This matte camo domed silicone band is the perfect option for your active outdoors man. The design gives him the ideal cover while being 100% safe from damage or generating noise/shine that come from traditional rings. 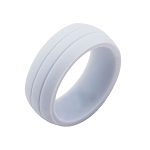 This is a high rated silicone that keeps your finger perfectly safe- yet at the same time isn't flimsy like a rubber band!The safest silicone wedding band on the market. Used by Firemen, Military, Mechanics, Policemen and factory workers all over the USA. 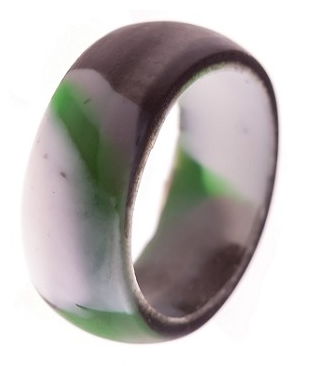 Our rings are made with pure medical grade silicone (so no skin reactions). High Performance and wearable 100% of the time. Fully functional, tough, durable and waterproof. No need to ever again remove (and potentially mis-place) your wedding band (for safety reasons or "safe keeping"). This wedding band chops wood as easily as it pumps iron at the gym. Totally safe and designed to break away at 40 lbs of pressure. No danger of "de-gloving" or finger amputation. It is made of medical grade HypoAllergenic silicone, so it is chemically inert and will not react with any chemicals or acids. Electrically non-conductive, so Electricians can begin wearing a ring again (even around high voltage). Because it is flexible it is perfect for those with large knuckles or temporary swollen fingers. I would give this ring 5 stars if the size was perfect. The 3XL says it will fit my finger (14.5) and it is extremely tight. 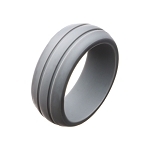 The ring looks great, and appears to be made of extremely durable material. I would definately recommend this ring.